-Spy Watch Camera with Digital Video Recorder/ Hidden Camera. This digital video recorder is a real watch and displays the time in seconds, minutes and hours. 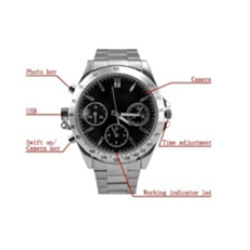 Our company has created niche in the field of offering Spy Wrist Watch to the clients. Spy Wrist Watch is precisely-designed by experts using quality assured raw-material and progressive technology in sync with industry quality standards. This product is tested on varied parameters of quality to maintain quality standard. We at Devik are the Leading Suppliers of Spy Camera Products. Contact us for best Product and Services.